Villages in Jharkhand could go dry by March. The state is facing acute water crisis because of two consecutive drought years. Devisal Tudu, a farmer in Dumka district in north-east Jharkhand, said the 400 families in his village Jeetpur depend on three open wells for drinking water but these are almost dry. “In the past five years the authorities installed eight hand-pumps in our village; now only two yield water, that too in trickles,” said Tudu. He has no idea how the residents will manage after February. Farmers blamed monsoon failure for their plight. Rain deficit in Jharkhand last year was 41 per cent as against two per cent in the rest of the country. Against the normal rainfall of 1,100 mm the state receives, some districts received as little as 500 mm rain. According to a study by Judav Organisation working on tribal rights, drinking water availability in villages in Deoghar, Giridih and Hazaribagh districts will be exhausted by mid- February. 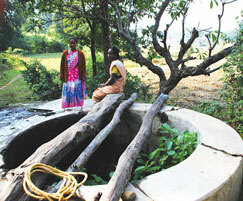 In Bokaro’s non-industrial areas almost all wells were dry in December. Data available with the state’s groundwater directorate confirms what the study has observed. 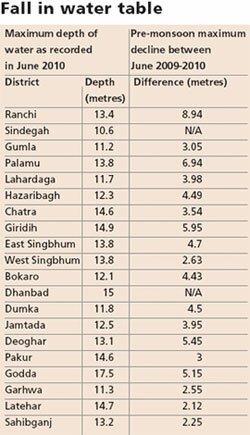 Jharkhand’s water table has declined by an average three metres between 2009 and 2010, from 17 metres to 20 metres (see table). T ill eight years ago the decline in water table level before and after monsoon was in centimetres; now it is in metres, said S L S Jageshwar, director of groundwater and minor irrigation. “Rapid urbanisation after Jharkhand became a separate state in 2000 is the main reason for the drastic fall in the water table,” said Jageshwar. According to his department’s statistics, groundwater extraction (last recorded in 2004) is high in Godda district where 67 per cent of the groundwater reserve is extracted. Water table in Godda has declined by 5.15 metres between 2009 and 2010. “This trend is dangerous as Jharkhand does not have deep aquifers found in the Gangetic plains and the existing ones in the rocky terrain are porous; they will soon become dry due to overexploitation,” said Jageshwar. Rain deficit has hit crop yields too. Only 24 per cent of about seven million hectare (ha) agricultural land in Jharkhand is irrigated. Remaining areas are rainfed. Jharkhand’s average agricultural produce in the non-drought years has been three million tonnes. But the yield in the past two years has been 2.2 million tonnes which is less than half of the state’s requirement of 5.5 million tonnes. While food shortage can be tackled through relief measures, what farmers fear more is the looming water shortage, said Hemlal Murma of Chickenia village in Godda. Chief Minister Arjun Munda has announced measures to tackle the water shortage. He said 17,000 new tubewells have been sanctioned and a water conservation campaign will be unveiled soon. Under it, new ponds and wells will be dug and old ponds will be desilted to create reservoirs for rainwater harvesting. 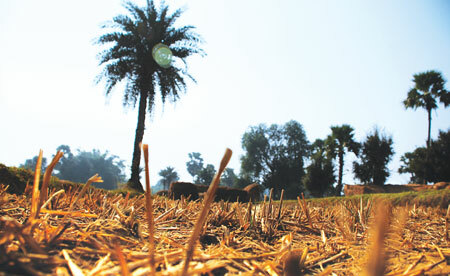 Munda said these measures would be enough to meet farmers’ needs even if rainfall is below normal in 2011. But these measures may not help if one considers Jharkhand’s past record. It has spent over Rs 560 crore on water harvesting and conservation between 2005 and 2011 under the Mahatma Gandhi National Rural Employment Guarantee Scheme (NREGS). More than Rs 28 crore was spent on tree plantation for drought proofing and Rs 72 crore on restoring water bodies under the scheme. As many as 16,550 water-related works were completed in one year by January 2011 under NREGS; 187,029 are pending. These works have not checked water table decline because non-scientific methods were adopted, said activists. Arvind Kumar, coordinator of Antidrought Campaign, a coalition of NGOs working on water conservation, said some of the ponds dug in Madhupur block in Deoghar are on high ground and resemble miniature volcanoes rather than ponds meant to collect water from catchment areas. Lack of community involvement is another reason for the failure of these projects, said Neeraj Kumar of NGO Sathee that works on tribal rights. He cited some instances in Dumka where community’s involvement in building check-dams has improved the water table. Officials said that a number of districts will soon be declared critical or semi-critical. Critical areas are those where over 90 per cent of dynamic water reserve (rechargeable water) is extracted. In Ranchi district, groundwater extraction is the highest at 140 per cent, which means in addition to the dynamic groundwater reserve, water is extracted from static (non-rechargeable) reserve found at greater depths. In Ranchi city, water supply to the 1.4 million population is restricted to between 15 minutes and half an hour every alternate day because the three reservoirs that supply water to the city—Kanke, Hatia and Rukka—have very little reserves. The state needs a sustainable plan, said Jageshwar, adding a bill on regulating groundwater that his department had proposed could have been effective. It was meant to ensure sustainable use of groundwater and contained provisions for rainwater harvesting and water conservation. Two blocks in Khunti district, Turpa and Raniya, showcase what can be done to overcome drought. Farmers in 60 villages in these blocks have not suffered water problems the past five years. “After the 2004 drought, farmers here reverted to traditional systems of water harvesting,” said Reajal Guddiya, a farmer from Berang village that borders the two blocks. Farmers built small mud check-dams that help irrigate paddy and raise the water table, said Guddiya. In Berang, water is available at a depth of less than six metres. Arvind Kumar said water availability in the state can be improved. “There is no effort to conserve rainwater which is why 70 per cent of the water is lost as runoff,” said Kumar. According to a study by the Anti-drought Campaign in 2008, just three per cent land under waterbodies in each village would solve the state’s water woes. we have started facing it. we have started facing it. Imagine, its just mid Feb, people in and around Kanke Road area where the Kanke Dam is situated have no water to drink, forget bathing and washing clothes. Those staying on rent are changing residence and the house owners or flat owners are thinking of moving somewhere else. Miss/faulty use of NREGS money. Ranchi which prided itself to be the summer capital of Bihar has lost it's charm. The once sleepy town where the population has increased manifold is due to poor planning and greed. Instead of planning a new Ranchi the town has been crammed with high rise buildings without adequate thought being given to availability of water or sanitation. Effluents are discharged on the road while deep borewells have been dug to supply water.As a resident of Ranchi for over half a century what , I notice most is the loss of greenery . The town was green and even during the peak of summer one did not sweat. This all started changing from the late 70's and after the formation of Jharkhand in 2000 it began to accelerate.This was all due to poor town planning. The town should have spread with newer roads and settlements should have been brought in well planned areas with little disturbance to the ecosystem.